Batteries are one of the most important components on-board your boat or yacht and are the heart of most electrical systems. They are used in a wide range of applications from starting the engine, to providing power for accessories and electric motors. Just like any other part of your boat, you need to care for your battery properly to keep everything running smoothly. Over time, it can lose capacity, resulting in unreliable and slow performance and finally being dead. A dead marine battery can be a major inconvenience, or even leave you stranded at sea. Because of that, it’s very important to make sure that you choose the best marine battery for your boat. What’s the Best deep cycle battery for my trolling motor? How to choose deep cycle batteries for an RV? When it comes to replacing a marine battery, boat owners have traditionally had two choices, starting or deep cycle. Deep Cycle Marine battery is designed to provide a steady amount of current over a long period of time for numerous electronics and accessories of the boat. Choosing a new deep cycle marine battery for your boat isn’t as easy as choosing a new battery for your car. It requires you to spend a lot of your time researching and reviewing. Since there are so many different sensitive technologies that are integrated into a modern boat, choosing a new deep cycle marine battery more complex than ever. In this article, we’ll walk you through everything you need to know to select the best deep cycle marine battery for your boat. We’ll explain some key features that you should consider before purchasing. Then we’ll also discuss some of the best deep cycle marine batteries on the market. Finally we’ll give you some helpful tips to extend the life of your batteries. What’s a Deep Cycle Marine Battery? Marine batteries on your boat handle two basic kinds of tasks, starting an engine and running electrical loads like lights, electronics and accessories for longer time periods. Deep cycle marine batteries are designed for the second task: running electronics and accessories such as trolling motors, fish-finders, GPS, radios and the like. In other words, they are the energy storage system of a boat. They power the electrical loads on your boat when no charging source (shore power charger, engine alternator, wind generator or solar panel) is available. Compared to starting marine batteries (or cranking marine batteries), which deliver high bursts of energy for short periods to crank the starter of your boat’s engine, deep cycle batteries recover fully after being heavily discharged over longer periods because their design features thicker plates with a high content of antimony. When the batteries are recharged, energy is re-deposited into the bank, and the process, or cycle, start over. Generally, deep cycle batteries should be sized to store three to four times the expected amount of energy to be used between recharge cycles. Because of its design, a deep cycle marine battery can withstand the rigors of several hundred discharge/recharge cycles, while a starting/cranking battery cannot. However, most deep cycle marine batteries that we are using on the boats today are “Dual-Purpose Marine Batteries” – ONE THING TO RULE THEM ALL. This type of batteries can deliver both a large amount of energy to crank an engine and start it up and deliver a consistent supply of energy for electrical accessories. The best dual purpose marine battery to buy is the Optima Batteries BlueTop Starting and Deep Cycle Marine Battery. Dual-purpose marine batteries came about decades ago when small freshwater fishing boats had room for only one battery to start the outboard and run the trolling motor. They still meet that need today, but they also can start the engine on any boat and power marine stereo systems or other entertainment electronics when the engine isn’t running. A dual-purpose marine battery must still meet your engine’s CCA or MCA requirement, and exceed it if you want it to have enough juice left to crank your engine after pumping out a few hours of your favorite tunes. Big, tsunami-inducing stereo amplifiers may not leave you with enough power to start your engine after entertaining a raft of boats. High-powered audio systems are often best served by a separate deep-cycle battery system. There are several different types of deep cycle marine batteries such as flooded batteries, gel batteries, AGM batteries, and lithium-ion batteries. All are made differently. We generally advise buyers to choose AGM batteries for their boats, however, it’s important to understand the pros and cons of each type. AGM deep cycle marine batteries are sometimes referred to as dry cell batteries, non-spillable batteries, regulated valve batteries, or maintenance free batteries. These batteries are the best deep cycle marine batteries for your boat. More and more boaters are switching to this type for a performance improvement over flooded batteries. Absorbent Glass Mat (AGM) technology became popular in the early 1980s as a sealed lead acid battery for military aircraft, vehicles and UPS to reduce weight and improve reliability. AGM deep cycle batteries feature fine, highly porous microfiber glass separators compressed tightly between the battery’s positive and negative plates, which are saturated with just enough acid electrolyte to activate the battery. During charging, precision pressure valves allow oxygen produced on the positive plate to migrate to the negative plate and recombine with the hydrogen, producing water. In addition to providing equal saturation across the entire surface of the battery’s positive and negative plates, the fibers in the dense glass mats embed themselves into the plates’ surface like reinforcing rods in concrete, providing more plate support and better shock and vibration protection than in conventional batteries. AGM deep cycle marine batteries have very low internal resistance, are capable to deliver high currents on demand and offers a relatively long service life, even when deep cycled. AGM is maintenance free, provides good electrical reliability and quicker recharging than the other types of deep cycle marine batteries. While typical lead-acid batteries need a topping charge every six months to prevent the buildup of sulfation, AGM batteries are less prone to sulfation and can sit in storage for longer before a charge becomes necessary. Even after 12 months sitting idle as long as they have been cared for, they can be recharged and put back into full service without any major damage. The battery is also able to stand up well to very LOW TEMPERATURES and has a low self-discharge. The combination of all these features makes AGM deep cycle marine batteries excellent for boaters who require the fastest recharging and reliable deep cycle ability. While AGM deep cycle marine batteries are the best choices for your boat, you should know there are several disadvantages of this battery type. The biggest disadvantage of AGM batteries is that they are sensitive to overcharging. Overcharging may damage the battery seriously and you’d have to buy a new one. The charging of AGM deep cycle marine batteries is different to that of the car battery. The voltage required to charge them is greater, therefore you will need to replace the original car battery charger if it is not programmable to charge AGM batteries. One of the best marine battery chargers for AGM batteries is the NOCO Genius GEN4 Waterproof Smart On-Board Battery Charger. Another disadvantage of AGM deep cycle marine batteries is that they do not like heat. This kind of batteries should be installed away from the engine compartment. Manufacturers recommend halting charge if the battery core reaches 120°F (49°C). The second type is the flooded battery – this is the most common type of deep cycle batteries that are used for boats, motorcycles and cars. Unlike other types, flooded batteries use a reservoir of liquid sulfuric acid, and produce hydrogen and oxygen when the battery is being charged. Vented wet cells allow the gases to escape into the atmosphere, unlike gel and AGM batteries, which recombine the gases and re-introduce them to the system. Hydrogen is an explosive gas, so battery boxes and compartments must be vented to let the gas escape safely. Flooded batteries contain a liquid in an unsealed container. This means that the battery must be kept upright and in a well-ventilated area to ensure safe dispersal of the hydrogen gas produced by these batteries during charging. The battery is also very heavy for the amount of electrical energy it can supply. Flooded batteries require periodic monitoring and topping up with distilled water. We would not recommend you to use flooded deep cycle batteries for your boat. However, there are several benefits of this type that you should know. Flooded deep cycle batteries handle overcharging better than gel and AGM batteries, because of this hydrogen venting and because they are not sealed like the other types. Their initial cost is lower than similarly sized AGM or gel deep cycle batteries, and much lower than the new type of lithium deep cycle batteries. Properly charged and maintained, flooded batteries are capable of between a few hundred and over a thousand charging cycles. As AGM deep cycle marine batteries, lithium-ion batteries are the best deep cycle batteries for the marine industry. However, this type of batteries is too pricey for most boaters. A good lithium-ion battery can cost four times as much as a good AGM battery. But if you are in a position of having the capital for the higher upfront costs of Lithium, you might find that life is easier and that choice is a cost-effective one over time. Smartphone, laptop, cordless impact wrenches, cordless air compressors, and even electric vehicles: Everyone knows the lithium-ion battery for energy storage in a variety of modern devices. But how does the battery work? A lithium-ion battery is an advanced battery technology that uses lithium ions as a key component of its electrochemistry. During a discharge cycle, lithium atoms in the anode are ionized and separated from their electrons. The lithium ions move from the anode and pass through the electrolyte until they reach the cathode, where they recombine with their electrons and electrically neutralize. The lithium ions are small enough to be able to move through a micro-permeable separator between the anode and cathode. In part because of lithium’s small size (third only to hydrogen and helium), Li-ion batteries are capable of having a very high voltage and charge storage per unit mass and unit volume. In the marine world, the choice these days and especially with higher loads – often simply comes down to Lithium-ion vs AGM. AGM batteries are more popular than lithium-ion batteries due to its lower price tag. However, lithium-ion batteries are much better than AGM batteries in many things. One of the main advantages of lithium-ion batteries is that they don’t suffer from a problem known as “memory effect”. Lead-acid batteries, like AGM batteries, had this problem. They “remembered” the last charge when they were recharged, and then returned only that last part of the stored energy. It was actually hard to recharge them unless they were fully discharged first. As Li-ion batteries don’t suffer this problem, they can be recharged even if they are not fully discharged, without produce any negative effect on their health. Unlike AGM batteries, lithium-ion batteries are considered practical to regularly use 80% or more of the rated capacity of a lithium battery bank, and occasionally more. Consider a 100 amp hour battery – if it was AGM batteries you would be wise to use just 50-70 amp hours of juice, but with lithium you could tap into 80 amp hours or even 100Ah. Of course, nothing is perfect. Lithium-ion batteries are very expensive. The best lithium-ion deep cycle marine battery can cost up to $4000 (compared to $600 for a top-of-the-line AGM). A gel deep cycle battery (also known as a “gel cell”) is a sealed, valve regulated lead-acid deep cycle battery and has a gel electrolyte. 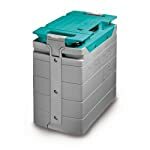 Unlike flooded lead-acid (wet cell) batteries, these batteries do not need to be kept upright. Gel cells virtually eliminate evaporation of the electrolyte, spillage (and subsequent corrosion issues) common to the flooded lead-acid battery, and boast greater resistance to extreme temperatures, shock, and vibration. As a result, they are often used in boats, vehicles and particularly off-grid solar systems. Gel Batteries are maintenance free battery thanks to the gel-like material inside the battery making it completely sealed. Gel batteries are excellent for extreme conditions because they have higher boiling points. Characteristics of gel batteries include high performance until the battery’s end, larger battery sizes availability, and performs better in warmer temperatures. However, gel batteries are typically expensive and equally sensitive to overcharging. You’ll probably never see any boater that uses a gel battery in their boat. Generally, gel batteries are less tolerant of high heat and are charged at lower power than AGM batteries. The real problem most boaters encounter involves the charger they use to charge their batteries. Some chargers have “gel” or confusing “gel/AGM” settings, that people think are appropriate or even intended for AGM batteries. Did you even notice the “most” qualifier in this charger setting picture? Gel batteries tend to have very narrow charging profiles and can be damaged easily by charging them inappropriately, so a setting that is suitable for a gel battery may not be suitable for any non-gel battery. As a result, using “gel” or even “AGM/gel” settings may not fully-charge non-gel batteries and could damage them. If you’re looking for the best deep cycle marine battery to use in your boat, we would highly recommend you to use AGM batteries. The BLUETOP high-performance AGM battery is the best deep cycle marine battery for boats with trolling motors and extensive electronic systems. With exceptional running time, outstanding vibration resistance, and more recharges than you’d get out of any other traditional deep cycle battery, this battery is the perfect choice for those who need a sure-starting, strong-cranking, maintenance-free power source. This is the most popular marine battery on the market. These Optima batteries are also a great premium choice for vehicles with large power demands. Accessory-loaded vehicles, high-demand electronic or audio systems, trucks with winches all add to the demand on a battery, and require one that’s designed to deliver more power than traditional batteries. The feature that makes Optima batteries the best deep cycle batteries in the marine industry is the SPIRALCELL technology. The heart of Optima SPIRALCELL technology is a series of individual spiral-wound cells composed of two pure (99.99%) lead plates coated in a precise coating of lead oxide. The unique cell design has an internal structural advantage that helps it hold its shape even under harsh weather conditions, corrosion and heavy vibrations, which traditional batteries are not built to withstand. Not only do batteries with Optima SPIRALCELL Technology have up to three times the life expectancy compared to standard lead-acid batteries, they also have the strongest starting power in their class. If you are using your boat in harsh environmental conditions, they are 15 times more vibration-resistant. Built using precision plastic welding techniques, the case is completely sealed, forming a one-piece, airtight package. Tightly compressed cells allow mounting in multiple positions without leaking or damaging your boat. 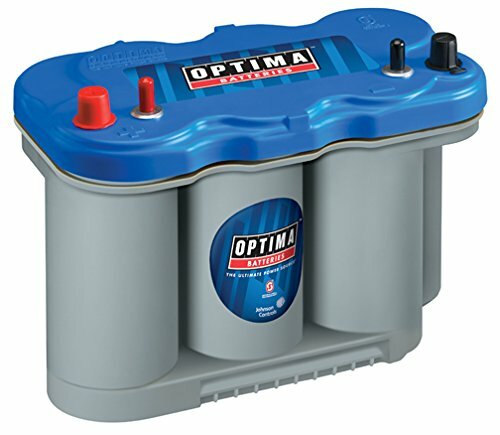 Optima BlueTop dual-purpose marine batteries (light gray case) are specially built for marine applications and RVs when the battery is used for both starting and deep cycling. The battery is a true deep cycle battery with extremely high cranking power. Optima YellowTop dual purpose batteries are designed for starting your vehicle and to support a load of electronic accessories, including car alarms, audio systems, and lighting. They are ideal for vehicles that don’t have an alternator or have electrical demands that temporarily exceed the alternator’s output. It ensures that those high electrical demands are satisfied until you’re able to recharge. Examples include racing vehicles without a charging system, dedicated drag racers, diesel-powered vehicles with aftermarket electronics, and vehicles with inverters, winches, or other accessories. Optima RedTop batteries are perfect for starting applications where your vehicle’s engine requires high amperage for a very short time. The discharge cycle is shallow and the alternator takes over after the battery starts the engine. Best for cars, SUVs, and heavy equipment where starting is the primary function. Do I need a special charger for this Optima Battery? Many chargers now have AGM-specific settings and desulfation steps that help recondition and recover deeply discharged AGM batteries. These are becoming more common, and they work well for all lead-acid batteries. They have the additional capability of doubling as a battery “maintainer” for batteries in storage. Some come with additional ring terminals to permanently attach to your battery leads so you can charge the battery externally with an accessible charger or maintainer. The best charger to charge Optima BlueTop batteries is the OPTIMA Chargers Digital 1200 12V Performance Battery Charger and Maintainer. This battery charger enhances the performance of OPTIMA and other AGM batteries, recovers deeply discharged batteries and extends battery life. With an easy-to-read, bright, backlit LCD gauge that displays battery charging, fill rate, mode settings and fault messages, this charger offers one of the best user interfaces. It is microprocessor controlled and features high-efficiency 12-amp changing that outperforms conventional chargers. Additionally it features a battery maintainer port and cable for maintaining the battery in stored vehicles. Consider the Odyssey 34M-PC1500ST TROLLING Thunder Marine Dual Purpose Battery if you don’t like the Optima. This is one of the best deep cycle marine batteries on the market. It’s dual-purpose battery that has both massive starting power and amazing deep cycling capability, up to 400 cycles at 80 percentage depth of discharge. 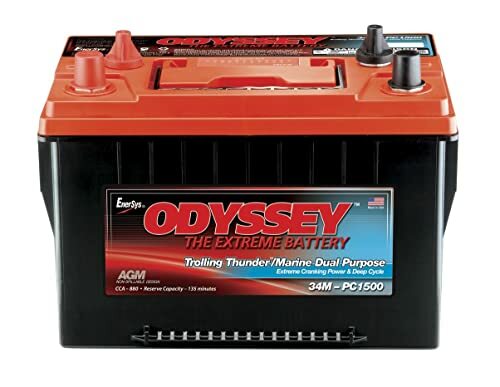 With 2 times the overall power and 3 times the life of conventional marine batteries, the ODYSSEY battery is ideal for TROLLING, starting and for powering the many onboard electronic accessories common in boats and recreational vehicles. Odyssey 34M-PC1500ST is constructed from flat plates that are made of 99.99% pure lead – not lead alloy. Pure lead plates can be made thinner, so the manufacturer can fit more of them in the battery. More ODYSSEY battery plates mean more plate surface area. And that means more power – twice as much as conventional batteries. In fact, ODYSSEY deep cycle marine batteries are capable of providing engine cranking pulses in excess of 1500 amps for 5 seconds – double to triple that of equally sized conventional batteries, even at very low temperatures. And they can handle 400 charge-discharge cycles to 80% depth of discharge. This extreme combination of power and performance makes ODYSSEY batteries perfect for boat accessories and trolling motors. Imagine three times the lifespan of your existing batteries with more available amp hours. Imagine that you can charge them in minutes. Now imagine that they are three times lighter and three times smaller. This is what you could get if you buy the MASTERVOLT Ultra Series Lithium-Ion Battery – the best lithium-ion deep cycle marine battery on the market. Three times the lifespan and increased capacity of flooded or AGM batteries; will cycle 2000 times at an 80% depth of discharge. This lithium-ion deep cycle marine battery is a SUPER-EXPENSIVE battery for a boat. It’s designed to be able to enjoy all the best properties of Lithium Ion technology in the harshest conditions (high charge/discharge currents, flooded environment, mechanical shock or vibrations). To do this, the MLI batteries bring two things on top of Lithium-iron phosphate cells: a sturdy, waterproof housing and the best Battery Management System (BMS). The BMS ensures optimal use of each individual cell, even during fast charge and discharge, and has integrated battery monitoring to always have the best information on the state of your battery. Last but not least, it has MasterBus/CAN communication to the Mastervolt battery charger to ensure the best possible recharging and lifetime of the battery. The Matervolt Ultra Series Lithium-Ion Batteries are installed on some of the world’s finest custom yachts. However, they are too pricey for most marine applications. But if you were building a high-capacity, multiple battery banks, and wanted a product that had the highest probability of delivering the longest cycle life, Mastervolt would be the best choice. A proven rule of thumb is to have 3-4 times your daily energy consumption in battery capacity. That means that boats that consume 120Ah per day of energy should consider having 360-480Ah of capacity. This rule allows you to avoid damaging deep discharges, and it reduces your recharging time. Powerboaters generally have very modest battery capacity and charging needs until they anchor in some nice spot and want to be free of engine noise and exhaust odor. Under these circumstances, they operate in “sailboat mode,” discharging their batteries deeply and periodically recharging them. Cruising Sailors generally plan on being “engineless” for a day at a time, hoping to operate their boats with their engine running only one or two hours each day. This allows other engine-driven functions (refrigeration, watermarking) to be performed while charging batteries with the engine. Their battery storage requirements are 100% related to the time between engine-driven charges, plus the added input from other sources they utilize: solar, wind, etc. Loads like inverters, refrigerators, and lighting have a large impact on your energy budget, so it is difficult to estimate your needs without actually adding up the loads and duty cycles to find the total consumption. Most boaters who operate on battery power end up using from 60-200Ah per day. The easiest way to calculate your energy usage is using an energy monitor, like the Victron BMV-700 Battery Monitor, and let it do the calculating for you. The BMV-700 is a high precision battery monitor. The essential function of a battery monitor is to calculate ampere-hours consumed and the state of charge of a battery. Ampere-hours consumed are calculated by integrating the current flowing in or out of the battery. Don’t know what size battery you need? There are standardized battery group sizes for marine applications. They are set by the Battery Council International (BCI). The group number has no relationship to the capacity of the battery. It is only a grouping based on the physical outside dimensions of the battery, and whether the lugs are on the top or sides of the case. Off-season battery maintenance will provide extended runtime and lifetime for your marine battery. Deep Cycle Marine and Boat batteries work best when the charge is maintained in the battery – do not store the battery in a discharged state. Never mix old batteries with new ones in the same bank. While it seems like this would increase your overall capacity, old batteries tend to pull down the new ones to their deteriorated level. Stay with one battery chemistry (AGM, gel or lithium-ion). Each battery type requires specific charging voltages. Mixing battery types can result in under- or over-charging. This may mean replacing all batteries on board at the same time. Regulate charge voltages based on battery temperature and acceptance (manually or with sensing) to maximize battery life and reduce charge time. Ensure that your charging system is capable of delivering sufficient amperage to charge battery banks efficiently. This generally means an alternator with 25% to 40% as many amperes as the capacity of your entire battery bank.